It’s 1790, a mere two years after the ratification of the US Constitution and the United States was in serious danger. Bitter political rivalry between Alexander Hamilton, James Madison, and Thomas Jefferson, plus two surging issues that inflamed the nation led to grim talk of dissolving the union. Then a single great evening achieved compromises that led to America’s expansion. How did Jefferson effect such critical compromise? He served Vino Nobile di Montepulciano! For Centuries, Vino Nobile di Montepulciano has been produced in the lovely hill town of Montepulciano in Southeastern Tuscany. Promoted to DOCG status in 1980, The Noble Wine of Montepulciano is made primarily from Prugnolo Gentile, the local clone of Sangiovese, of which the final wine must contain at least 70% with the balance permitted to be other approved grapes such as Colorino, Canaiolo, or Malvasia. In my experience, the best examples of Vino Nobile are close to 100% Sangiovese. Since 1974, Avignonesi has been an iconic producer from this charming hill town. Named after a member of the founding family, the estate was purchased in 2009 by the Belgian born Virginie Saverys, after two years as a silent, minority owner. Since taking over at Avignonesi, Saverys has worked tirelessly to transform the estate based on her vision. Vineyard sites have been expanded and the estate is now certified biodynamic and organic. Saverys is adamant about leaving the vines and soil in better condition for the benefit of future generations. In fact, she considers it her duty. 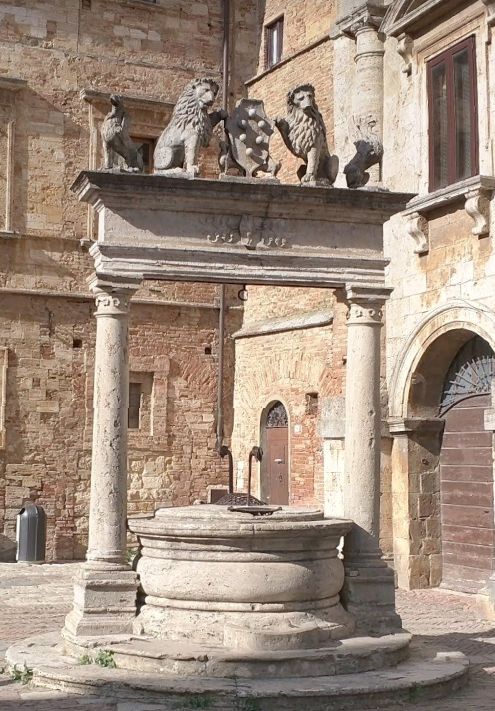 Today Avignonesi is the largest producer in Montepulciano, with vineyards located there and in nearby Cortona. 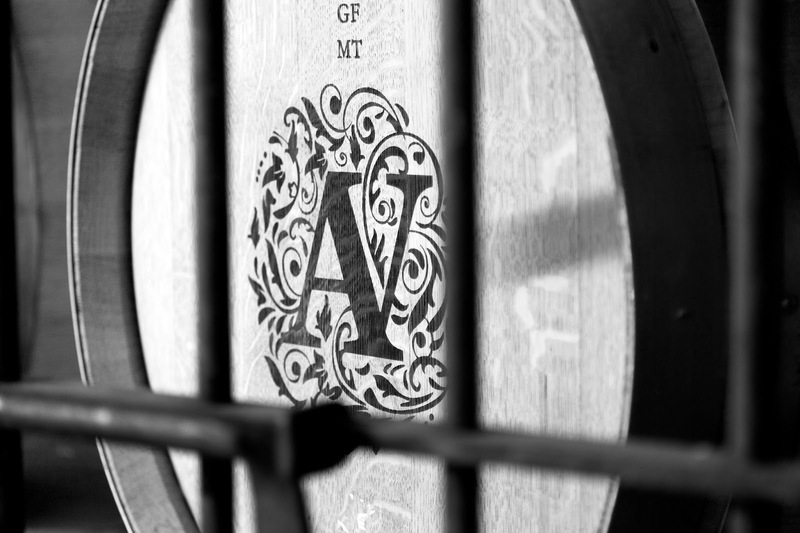 With almost 495 acres of vineyards scattered over 8 distinct vineyard properties, all of Avignonesi’s wines are produced from 100% estate grown fruit. Recently, I was fortunate enough to catch up with Virginie Saverys to discuss recent developments at Avignonesi and to taste through the new releases from the estate. Ciao Virginie! Thank you for a few moments to contribute to this article. I’m curious, first and foremost. What was your biggest fear or concern in deciding to acquire Avignonesi 100%? “Grazie a lei, Giovanni. I actually went through with the acquisition with not much fear. 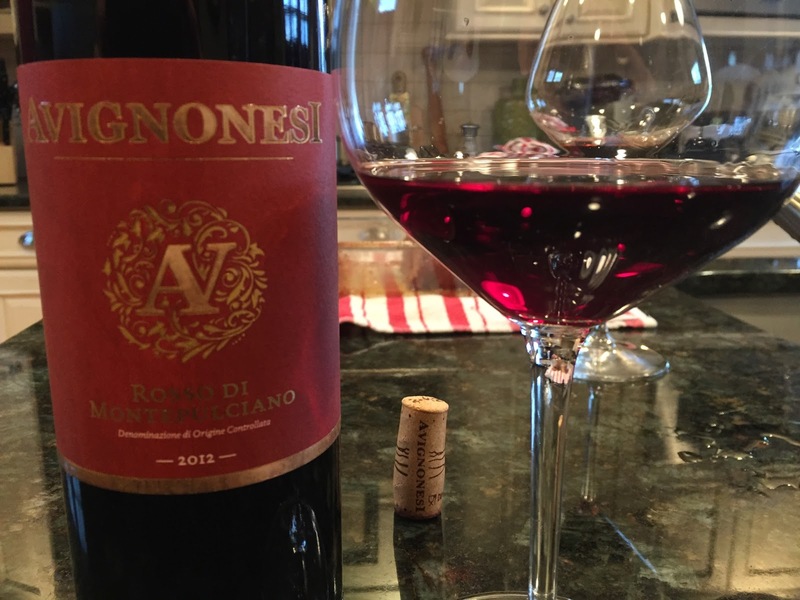 I certainly wasn’t prepared for what it means to be a wine producer, but living in the area already, I knew I would be able to take the reins myself and actively drive the transition from what Avignonesi was when I bought it to what it is today. In retrospect, the biggest obstacle has been bureaucracy, a word which in Italy takes on a whole new meaning and forces you to move in slow motion or sometimes to stop a project entirely. We tasted the full range of Avignonesi’s red offerings for this article; beginning with their Rosso di Montepulciano. The 2012 Rosso di Montepulciano is made from 100% Sangiovese grapes. This medium ruby colored wine has straightforward aromas of strawberry and soft spices on the nose and palate. Good overall balance, light to medium bodied, and everyday red with not too much complexity. 85 points, about $12. Virginie, for sure a lot has changed in the short time you’ve been at the helm of Avignonesi. What do you think has been your biggest contribution to the “rebirth”, as it were, at Avignonesi? “The single biggest change which I have personally introduced is the conversion to a natural viticulture, which combines organic and biodynamic vineyard practices. Many things have changes. We have a new company image, new labels and a renewed focus on Sangiovese, to mention the most obvious, but the commitment to safeguarding and enhancing the quality of our land is my main concern. Do we make better wines because our process is natural? That’s for others to decide. What I can do is make sure that my soil, my plants and my grapes are as healthy as possible, and at the end of the day I believe that also translates into a benefit, both for the people who work for me and for the consumer who drinks Avignonesi wines. The next wine we enjoyed was the recently re-designed Vino Nobile. Now 100% Sangiovese and organic, the 2011 also sports the new label design. For another benchmark, here’s my review on the 2010 from a while back. The 2011 Vino Nobile di Montepulciano is clearly a step up. Former vintages contained percentages of various red grapes but this is now 100% Sangiovese. Medium ruby in color, the ripe dusty berry notes on the nose and palate are very enticing. Lovely balance. Juicy and fresh on the palate with flowers, earth and tobacco leaf notes adding some complexity. Good value around $21. 90 points. Why was the production of Grifi stopped and what changed to bring it back into production? Who made that decision? 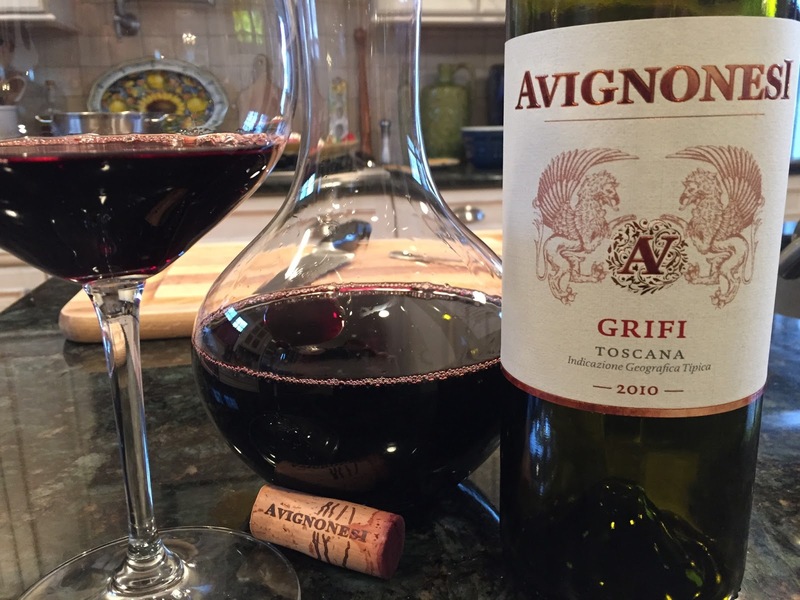 For this report, we sampled the latest two releases of Grifi, Avignonesi’s Tuscan blend of Cabernet and Sangiovese. Sourced from two different vineyard parcels, Cabernet from Cortona and Sangiovese from Montepulciano, the vines that provide the Cabernet are 8-12 years old while the Sangiovese vines are almost 40 years of age. The varietals are vinified separately in stainless steel and then aged in French barrique; new barrels for the Cabernet and 2nd and 3rd passage barrels for the Sangiovese. 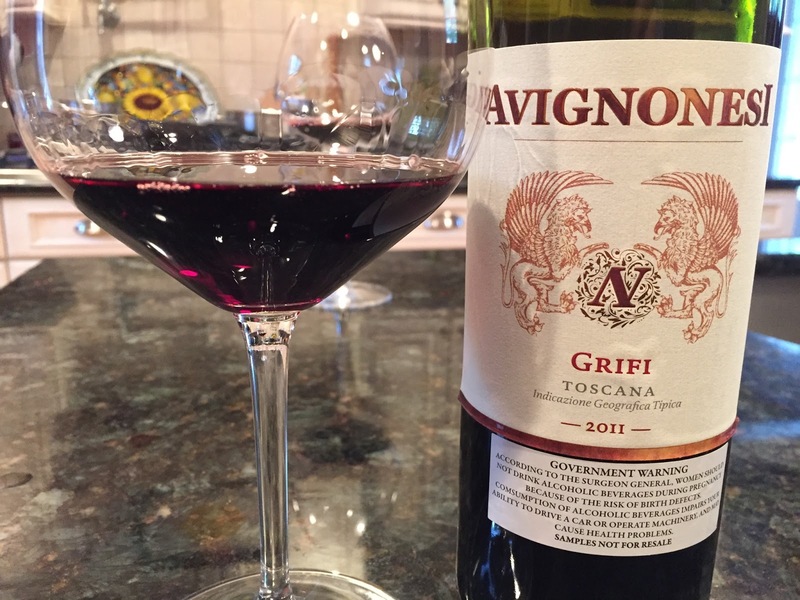 The 2010 Grifi is a blend of 60% Sangiovese and 40% Cabernet and is deep, dark ruby in color. We decanted the wine for 60+ minutes to develop the wine’s aromas. Huge notes of fennel, salami and smoked meat on the nose with dark cherries and new leather. The aroma is outstanding! On the palate, there’s a huge core of ripe red fruits with tobacco, leather, anise and lots of dusty, integrated tannins. Very well balanced with a long, mineral driven finish. Outstanding. 96 points. SRP ~ $50-$60. The 2011 Grifi is more than a worthy successor to the 2010 and although different, is just as delicious. The 2011 is a blend of 50% Sangiovese and 50% Cabernet which is slightly odd because the former is the darker wine. Deep ruby with violet highlights at the rim, the 2011 displays aromas of berries, plum, mint and flowers. Flavors follow the nose with loads of concentration with added notes of leather and anise. Again, the terrior comes through with lots of integrated, dusty, powdery tannins. Overall, a fleshier experience relative to the structure of the 2010. I love it. 95 points. SRP ~ $60. Faithful readers know that I have a soft spot for Tuscan Merlot. There’s something about the grape and the Tuscan terroir that I love. So, fair disclosure. 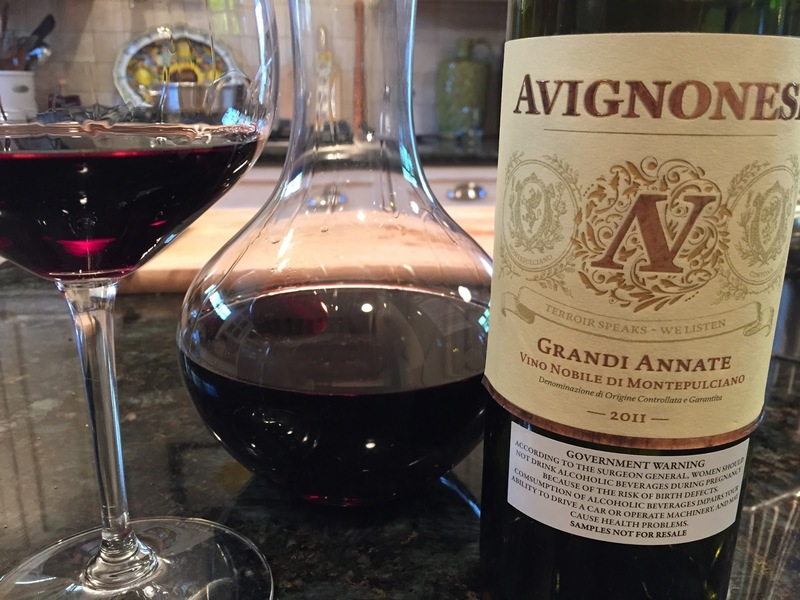 I’ve written about Avignonesi’s wonderful Merlot in the past, and it keeps impressing me. Desiderio is sourced from vineyards in Cortona and was first created in 1988. The wine takes it’s name from a prized Chianina bull that belonged to the estate’s original owner when it was a working farm in the second half of the 19th century. The bull graces the wine’s label. The 2010 Desiderio is 100% Merlot from the Le Capezzine property in Cortona. In the glass, the wine is deep purple color with the slightest of fades at the rim of the bowl. Aromas are plentiful and offer fresh herbs, lavendar, crushed black plum and menthol notes. Texturally, this wine displays the meatier side of Merlot, with spicy black plums, mint and coffee on the palate. It’s got more structure than you might expect and quite a bit of “grip” to the tannins in this 2010. Can easily benefit from 3-5 years in the cellar. Delicious. 93 points. SRP ~$50-$60. Virginie, let’s talk a bit about Avignonesi’s Flagship, Grandi Annate. The last vintage that was released of this wine was 2007. What has happened since that time? Grandi Annate – “Greatest Vintages” – is only produced in optimal years. In the past, and under the old interpretation of this wine, I was not an admirer. I recall the wine tasting overly sweet, infused with too much oak aromas and flavors, and possessing an almost candied nature. I am glad to report that this re-invented wine bears no resemblance to it’s fore fathers. The 2011 Vino Nobile di Montepulciano “Grandi Annate” is a deep vibrant ruby in the glass. We decanted the wine for almost two full hours at the urging of the winery. From the glass this is wonderfully perfumed. Fresh flowers, sandalwood, crushed berries and spices leap from the glass. This evolves seemingly with each swirl. On the palate, the wine is round and elegant with a large core of crushed wild cherry fruit that is accented by pipe tobacco, cedar, turned earth and powdery, dusty Tuscan minerals. The flavors sit firmly on the midpalate and roll to a classy, almost feminine finish. An absolutely outstanding wine and re-establishes itself among the flag bearers of Montepulciano. 97 points. SRP ~ $95. Despite the improvements and renewed commitment to quality that Virginie has brought to Avignonesi, the estate has no plans to rest on its laurels. 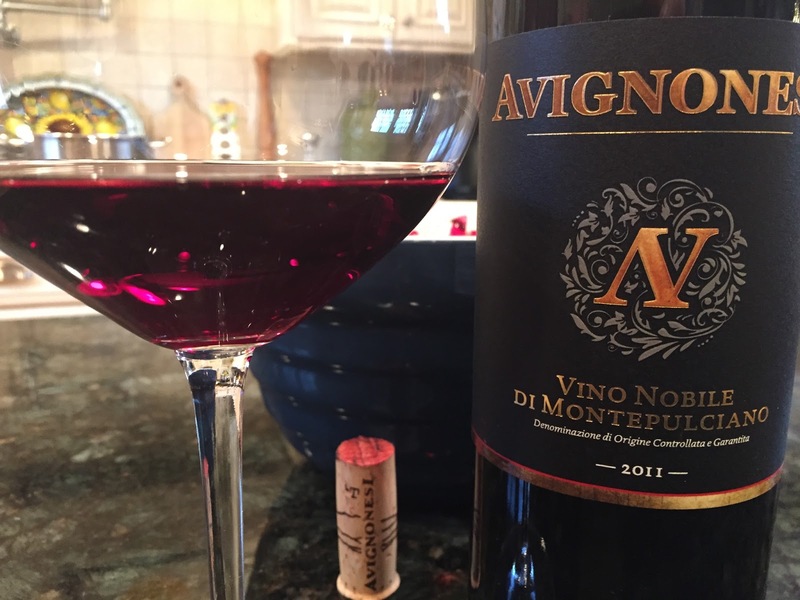 Through her leadership, Avignonesi continues to renew its commitment to Sangiovese, focusing its efforts on mapping and harnessing the nuances of Montepulciano’s unique terroir. They are off to a great start! Very informative write-up. 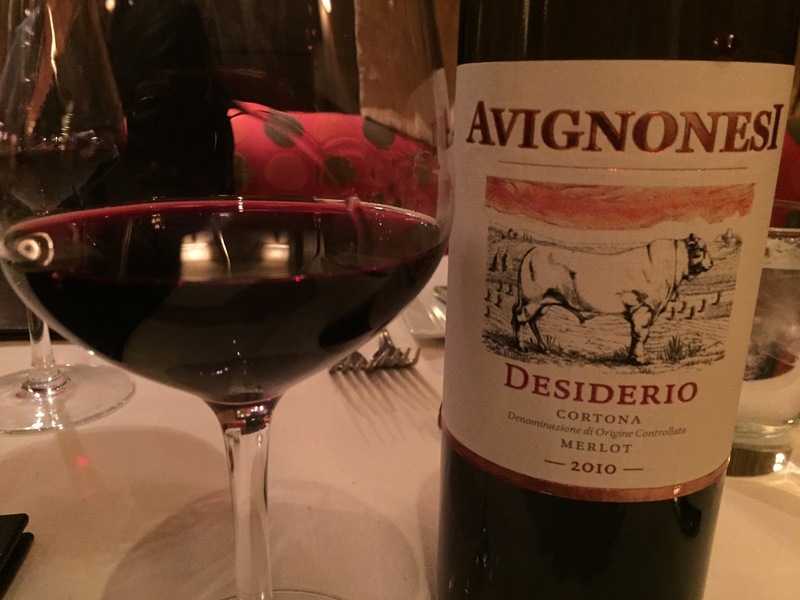 I have always been an Avignonesi fan, the Vino Nobile and Desiderio, I currently have a couple of the older Desiderios in the cellar. I look forward to tasting the wines under from the new ownership, especially the Grifi. Searching now for the Grifi. Spent my 50th birthday at Avignonesi ( a few years ago, just a few!). Wonderful property and great meal. Joe, you know we both share a love for Vino Nobile. Poliziano, Boscarelli and Avignonesi are clearly in the upper tier. Grifi 2011 is not released yet but he 2010 is out. Grandi Annate 2011 is also released. Good luck in your search.